This section is from the book "The Engineer's And Mechanic's Encyclopaedia", by Luke Hebert. Also available from Amazon: Engineer's And Mechanic's Encyclopaedia. This arrangement is extensively adopted on the Clyde, with some variations in the minor details, according to the views of different makers. At a is the condenser, constituting the base of the cylinder b . the cross-head c of the piston-rod, instead of being parallel to the shaft, as is usual, stands at right angles to it; and from the ends of the cross-head rise two rods d d, which are connected at top, forming with the cross-head a triangle. Through the apex of this triangle passes a pin, the ends of which work in guides e, to cause the piston-rod to preserve a parallel motion. The connecting-rod f is suspended from the central part of the pin, and the lower extremity is connected to the crank g, which revolves within the triangle. The frame h, which carries the shaft, is supported upon four short colums, which rest on the cylinder; and the vertical guides e are braced to this frame by the rods kk; I is the slide valve; m a bonnet over the foot-valve: n the air-pump; o the hot-well on the top of it: p the waste pipe. The air-pump is worked by the beam q, which is supported at one end by the rocking standard r, and at the other is connected to the apex of the triangle. The feed-pump s, and the bilge-pump on the other side of the air-pump, are worked from the cross-head of the air-pump. We believe Mr. David Napier introduced the plan of suspending the connecting rod above the crank in steam vessels, hut Trevithick employed a similar arrangement in his steam-carriage in 1802. The motion for the air-pump, shown in the sketch, (p.692) is not that which is commonly employed, but is the best which we have noticed. 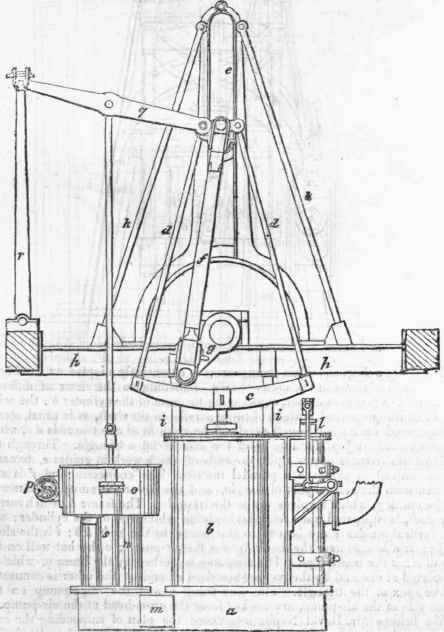 Sometimes the air-pump is worked from one end of the cross-head of the piston-rod, and the bilge-pump and feed-pump from the opposite end; and in some vessels the slide-valve is at the side of the cylinder, and two air-pumps, of small diameter, are worked from the extremities of the cross-head. This arrangement, like that of the Oscillating Engine, admits of a long stroke, without carrying the shaft very high; and the parts in motion being few, the friction is proportionately small. It has, however, some serious disadvantages; a considerable weight lies at a great height above the centre of gravity; the oblique thrust of the connecting-rod acts with some leverage against the upper framing; and the engine-house requires to be carried above the deck.